RescueTime alerts, a Premium-only feature, give you the ability to have on-screen notifications presented to you for specific productivity benchmarks that you determine. For example, you can have a popup message alert you when you have spent more than one hour of distracting time or more than four hours spent on productive time. 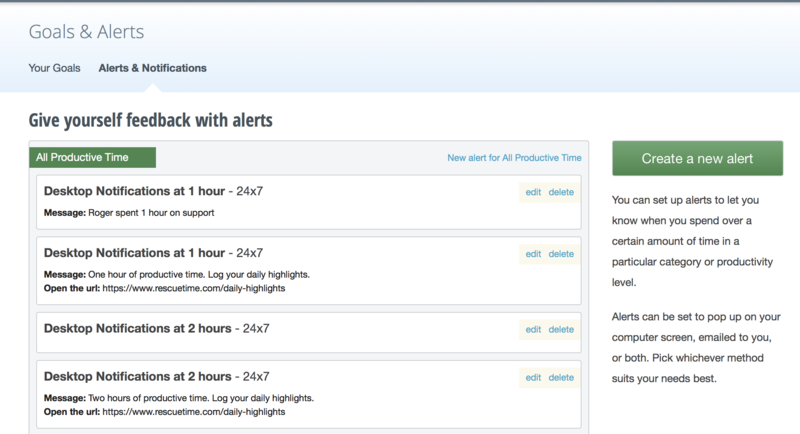 The alerts feature is often used in conjunction with RescueTime Goals but does not need to be. To access the Alerts page click the Tools button and select the Goals & Alerts. 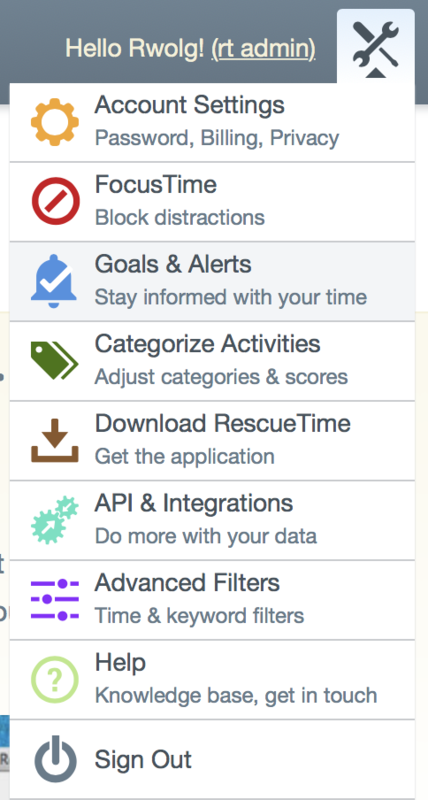 On the Goals & Alerts page, select the Alerts & Notifications tab to view a list of current alerts. To create a new alert, click the Create a new alert button which will open the alert editing interface. You set the parameters for the alert, and select the alert to be for more or less than a specified period of time. Time is entered in hours. The hours' field is editable so you can type in a custom number of hours using decimal format. There is a category drop-down box used to select the category of activity for the goal. It is what determines progress in the time measured for an alert - all activities matching that categorization will be tracked cumulatively as a measure of progress. 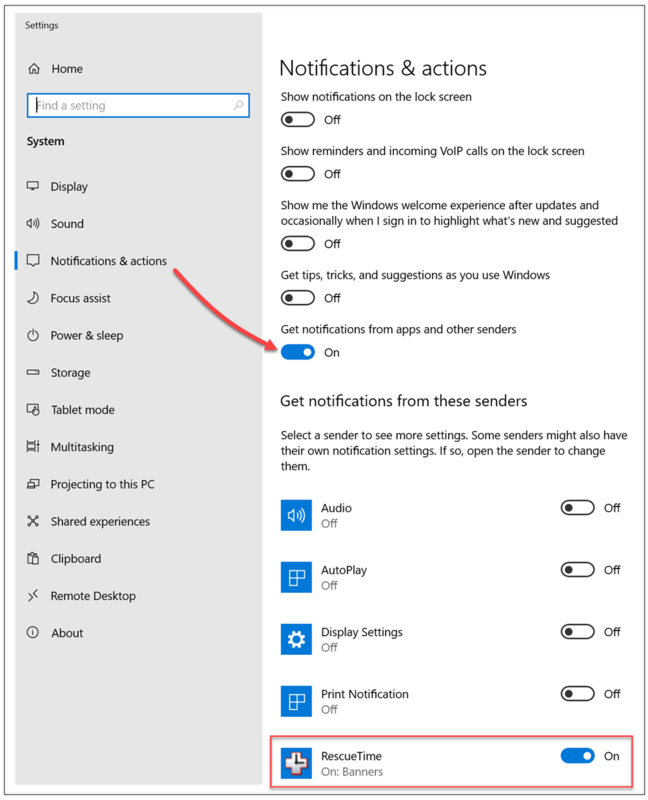 Click on the Alert actions link to display advanced features. 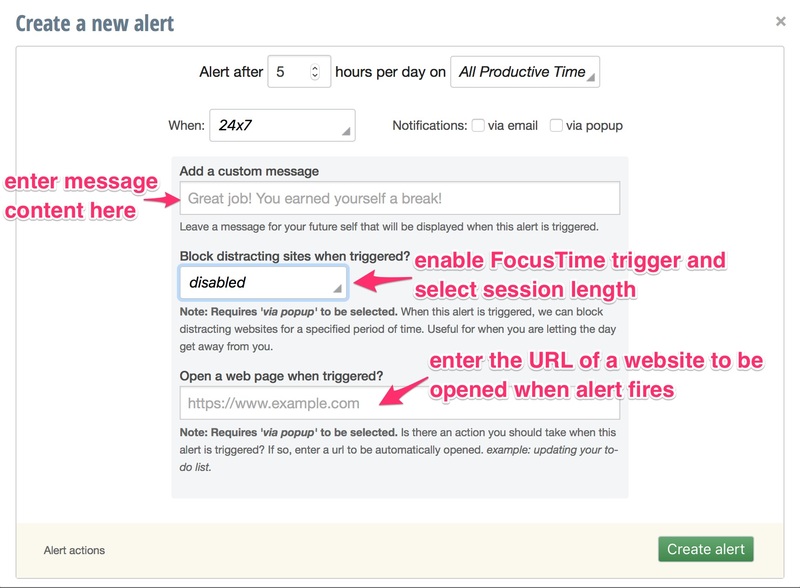 You can customize the message that shows as the alert content, and use an alert to start a FocusTime session. From Block distracting sites when triggered? drop-down box select the desired length of the FocusTime session. You can set a webpage to open in your browser at the time of the alert. As an example, at RescueTime have this set after each hour of productive time. It opens the Daily Highlights page, so we are reminded to keep a record of what we have been doing. You can link alerts to many other services via our integration partners, and you can find a link to more information about that at the bottom of the page. Windows Users: Please note that RescueTime's pop-up notifications are not generated by the RescueTime application but originate from the Windows notification system.